« Three words for June grads who want a career in writing. One aspect of writing often ignored by tutorials and even teachers is the need for quality research. Even when writing fiction, accurate research about a topic can be essential to the credibility of a story. Wrong dates, unproven claims and erroneous facts can drive a reader away faster than almost anything else. Unfortunately this doesn’t seem to be true with the news media and social sites. All too often even the most outrageous errors quickly escalate into faux facts and reach an unprecedented number of people before being properly vetted. This coming Monday is Memorial Day, originally called Decoration Day, and there is no definitive version about its origin. Currently making the rounds on the internet is the story of former slaves in Charleston, SC, who on May 1, 1865, removed the bodies of Union soldiers from a mass grave and interred them properly in gratitude for their sacrifice. The story is true and that is as good a place to start as any, but there is no evidence that event actually triggered any formal observances in the years that followed. Further research shows the origin story is at best muddled since at least two dozen cities and towns, both north and south, claim to be the sites for the first Memorial Day events. Boalsburg, Pa, boasts it was the first town to decorate graves of soldiers in 1864, Carbondale, Ill, has cemetery markers that assert it was the first site for Memorial Day, and Columbus, Ms, claims the first formal observance took place there in 1866. The commonly accepted origin of Memorial Day is that three years after the Civil War ended, on May 5, 1868, Major General John Logan, head of a Union veterans’ organization, established Decoration Day on May 30 as a time to adorn graves of fallen soldiers. A large formal observation ensued with over 5,000 people attending a ceremony at Arlington Cemetery near Washington, DC. That ceremony still occurs annually and draws about 5,000 attendees each year. After World War I the observance was expanded to include all US soldiers, not just those who died in the Civil War, and in 1966 the US Congress and President Lyndon Johnson declared Waterloo, NY, as the official birthplace of our modern Memorial Day celebrations. 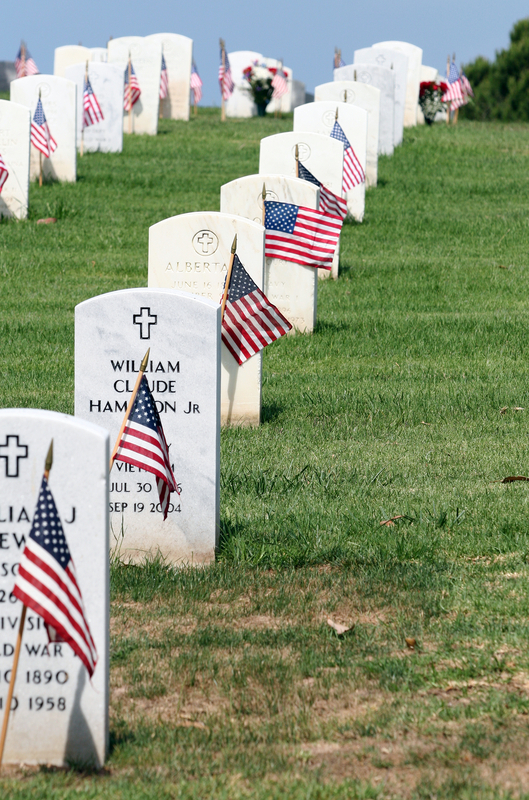 Memorial Day finally became a national holiday in 1971. Regardless of where or how formal observations started, since 2000 there has been a law called The National Moment of Remembrance Act that encourages Americans to pause whatever they are doing, at 3:00 PM on Memorial Day, for one minute to reflect and honor those who died in service to the country. That seems a small price to pay for what the men and women of the US military have given us in return. I know what I will be doing at 3:00 this Monday, and I hope others will join me for that one special minute. This entry was posted on May 23, 2014, 9:30 pm and is filed under Breaking News, Legends, Research. You can follow any responses to this entry through RSS 2.0. You can leave a response, or trackback from your own site.